Here’s an experiment I tried. Made some stuffed okra, cooked half of it the traditional way in a pan with a little bit of oil and baked the rest of it in the oven with only a very light spray of oil. There was very little difference in taste between them. 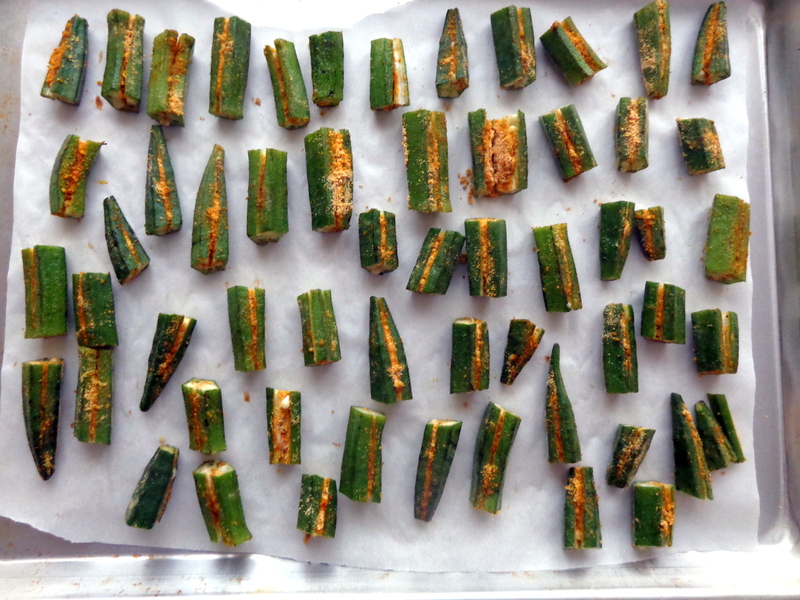 The baked okra was in no way inferior to the stove-top cooked okra, in fact, it is a lot healthier! The secret ingredient: peanut powder. It releases enough oil to make the dish super tasty. 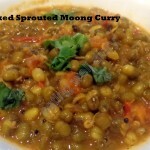 Sharing this at the Virtual Vegan Potluck 11 at Annie’s blog An Unrefined Vegan and with folks at Fiesta Friday #33 over at The Novice Gardener’s blog. Use the slender type of okra for this and make sure they are good by twisting the tip of the vegetable. 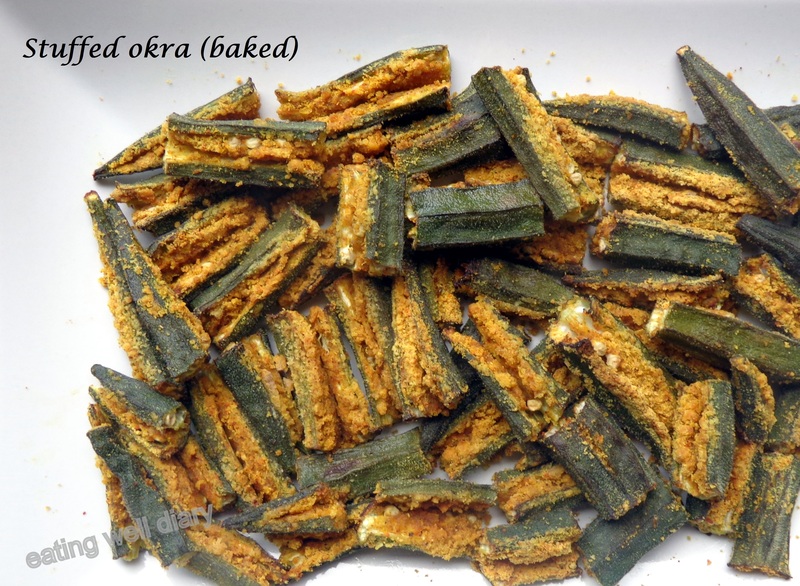 If it snaps easily, the okra is good. chickpea flour (besan)- 4-5 tbsp. red chilly powder- 1 or 1 1/2 tsp. roasted peanut powder- 3 tbsp. dry mango powder (amchur)- 1 tsp. * Wash and dry okra on a towel. Mix all the spices with besan in a bowl. 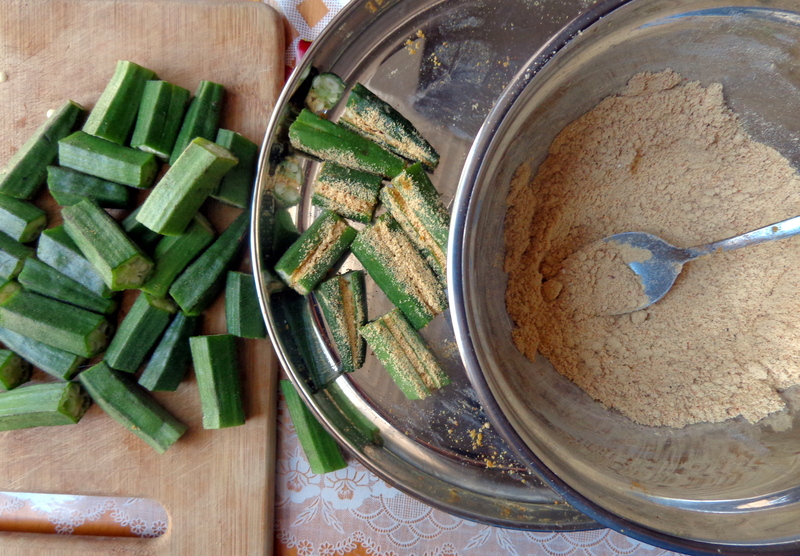 * Cut each okra into 2-3 pieces, make a vertical slit in each and add the powder in with a spoon. * Preheat oven to 400 °F. If using oil spray, lightly apply spray on the stuffed okra. * Place on an aluminum baking sheet lined with parchment paper, slit side facing up. Bake for 25-30 minutes. 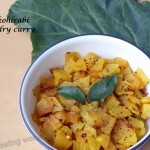 * Enjoy with roti or any rice dish. Store in a closed container. i have tried stuffing okra with chickpeas- your version looks great Apsara…will try your version sometime..
thanks, Chitra. 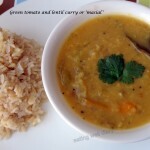 I feel that using besan would be a lot easier than stuffing with chickpeas itself. Love this idea! Thanks for sharing Apsara! This looks so good to me, Apsara! 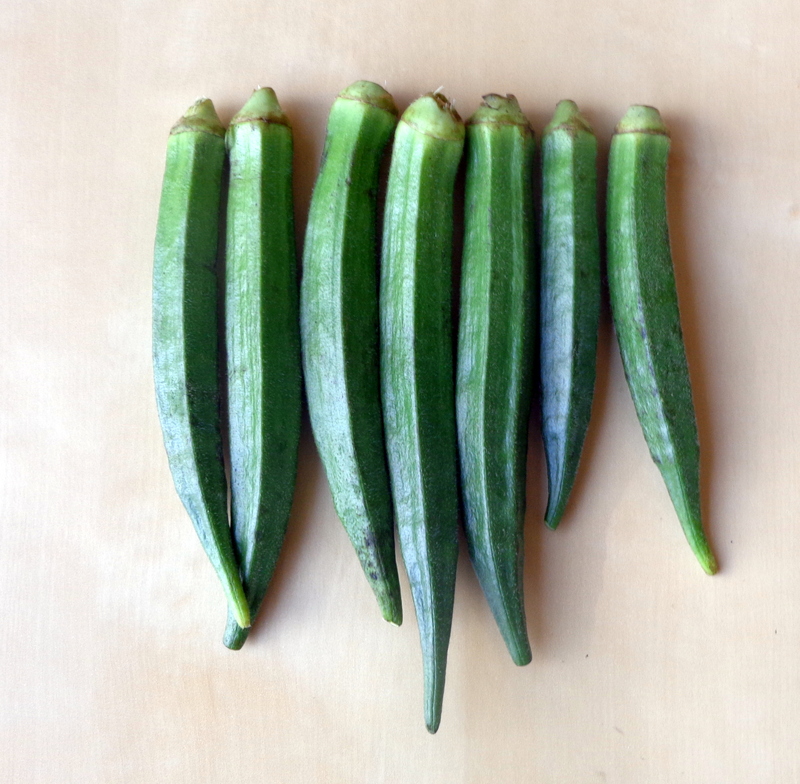 I love okra, and it is one of the things that actually grows well in the heat here in Arizona. I never thought of stuffing them or baking them. I’m so glad to learn about it. Now if I could just convince my husband that okra is delicious! :) Maybe this recipe will change his mind. Yes, I’m not a fan of slimy okra too. But the besan absorbs all that, and I was happy with the result too! Yum Apsara! Looks like your experiment worked out wonderfully! I’m another who has never tried stuffing okra -will give it a try. Ooh, yes please! I’ve always been put off by the oil requirement so this sounds perfect for me! I am delighted by this too, Elaine! Fabulous! I must say it looks likes it takes a lot of patience to stuff these little okras, but they are so delicious looking! How original! Yum, this looks so healthy and what a nice, simple recipe, love that it has been baked too, will have to give this a go. Let me know when you try it, Loretta. Your version sounds equally easy, Vidya. I bet the rice flour made it crisp too, need to try that sometime!